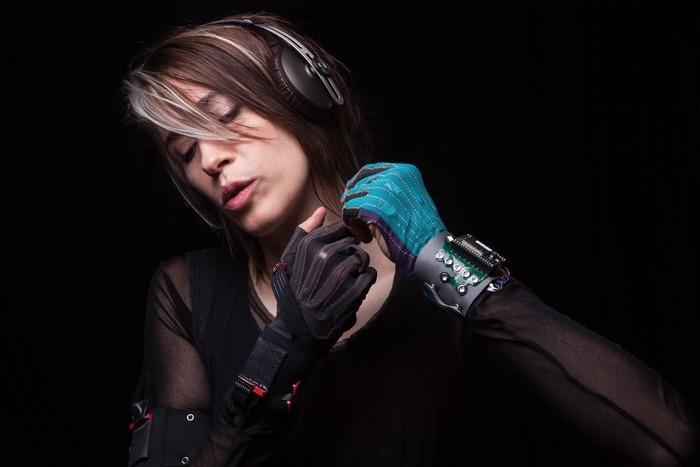 Back in 2012, musician Imogen Heap dressed up like something from Star Trek and showed a magical glove to the world at a number of different events hosted by TED and Wired, which allowed her to make music using gestures, movements and sci-fi costumes. Fast-forward to 2014 and the state-of-the-art wearable tech device, called the Mi.Mu, has been added to Kickstarter in the hope that Heap’s ambitious plans will change the way we make music for good. Over the past few years she’s been working with a team of “scientists, engineers and artists” from what she calls the “nerd underworld” to make the gloves a reality. In the promo video for the Mi.Mu she explains they come packing “high precision wearable sensor technology”, which detects sharp movements and lights up to provide the wearer with feedback all completely wirelessly. The team are working to develop software to allow you to define your own gestures and although they can be used for lots of different purposes, they’re built with music-making in mind. It’s hard to take Imogen Heap seriously as she dances around like a fairy queen from the future on stage with her gloves, but the idea of bringing a more intuitive and natural way to the modern world of music certainly makes sense in theory. There are still 22 days to go before the Kickstarter project ends and £64,000 for a £200,000 goal has been raised, which looks promising for the Mi.Mu.